Simple locking collar. Constructed much like a single PXDirect Handcuffs, only larger. There are two welded iron loops on the collar for attaching to chain or whathaveyou. The collar locks when a hex-screw is applied to hold the two halves together. 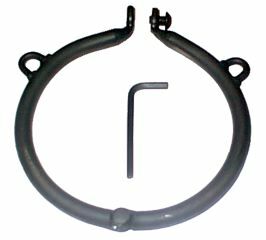 The collar is made from 3/8" round stock with a welded rivit acting as the pivot hinge. The sizing is sort of what you would think - with a M fitting most people well. Since the head is MUCH larger than the neck on humans, any size will be secure, the only difference being how snugly the collar encircles the neck.